Perhaps Texas A&M is executing a late basketball season U-Turn. Or the Aggies may just be spinning in circles. The direction the Aggies’ are headed might be learned on Tuesday night when A&M (9-13, 2-8) takes on Georgia (10-13, 1-9) at 6 p.m. at Reed Arena. While the Aggies have stumbled most of this season, the Bulldogs have fallen and can’t get up. They’ve lost eight consecutive Southeastern Conference games with a non-conference upset of Texas their only respite. So, after defeating Missouri 68-59 on Saturday despite being without injured Josh Nebo and ailing John Walker, the Aggies have a great opportunity to post consecutive victories for the first time since December when they recorded back-to-back wins over Valparaiso and Marshall. Billy Kennedy said that A&M forward Josh Nebo will be a game-time decision. In its first season under coach Tom Crean, Georgia has four players scoring in double figures. Rayshawn Hammonds, a 6-foot-8 sophomore forward, averages 12.7 points, while 6-11 sophomore forward Nicolas Claxton averages 12.4. However, putting the basketball through the rim hasn’t been the Bulldogs’ problem. Their issues are holding on the basketball and preventing opponents from scoring. Georgia averages 16.6 turnovers to rank 340th in the nation. The Bulldogs also allow an average of 75.2 points per game. Five of Georgia’s last six opponents have scored at least 80 points. Yet, Georgia could cause serious difficulty for the Aggies, especially in the paint. Claxton leads the SEC in rebounding and blocked shots. He could pose an even bigger problem if the 6-foot-9 Nebo remains sidelined. Kennedy is uncertain whether Nebo is available. 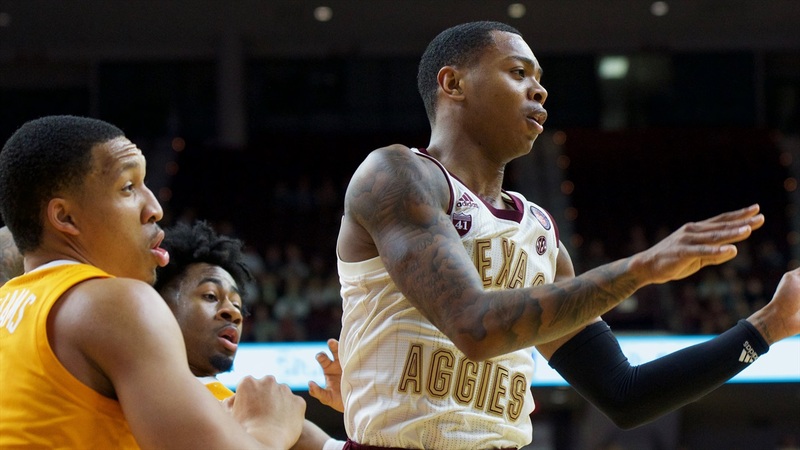 The Aggies were able to compensate for Nebo ’s absence because Christian Mekowulu had a strong game inside, while Wendell Mitchell, T.J. Starks, and Savion Flagg shot well from the perimeter. Mekowulu posted a double-double with 15 points and 10 rebounds. Mitchell scored 20 points, Starks had 15 and Flagg had 12 and they all combined to hit 5 of 11 attempts from 3-point range. We’ve had different types of adversity and we fought. Going into that shoot-around we look around and we didn’t have that many guys. More impressive, the Aggies did not quit despite falling behind by as many as 12 points in the second half. “This team has been fighting all year long,” Kennedy said. A&M snapped a three-game losing streak with that win over Missouri. Mitchell said in order to start a winning streak the Aggies can’t relax.